People resort to inventing ‘work’ no matter how unnecessary their services may be just to survive in the city. You may see those folks calling out for passengers to ride the jeepney and they’ll receive few coins as fee from jeepney drivers. I’m sure some drivers find this unnecessary but they readily pay. They can relate, and so they recognize the effort of others trying to earn few pesos. You may also see those folks guiding drivers out from roadside parking, or those folks hailing taxis for other people hoping for tips. Some folks can be cunning where they capitalize on flash floods by providing makeshift raft for pedestrians who don’t want to walk on dirty water. 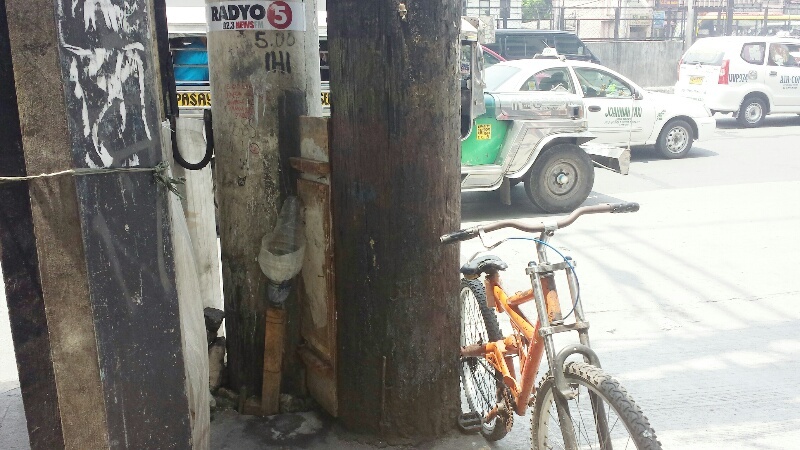 Somebody also thought of capitalizing the lack of public toilets along EDSA by setting up makeshift pay urinal made from repurposed water container, and using scrap hose as drain to the sewer which has been secured to the ground by scrap wood.